What happened to the promised Indian Summer – doesn’t look like it’s going to happen now!! So in order to stay warm on those chilly Autumn days it’s time to embark on some cosy Autumn sewing. First thing I did last week after the urge to sew took hold was to look at the fabric shelves to choose a nice fabric – I hadn’t yet decided what I was going to make. This is the advantage of running a fabric shop! 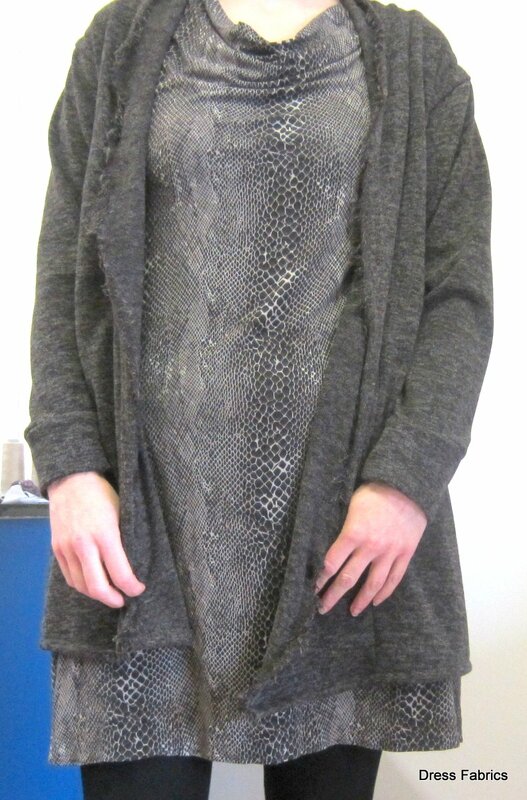 I chose this Sweater Knit Viscose it’s a dark brown with a lighter brown flecked through it. I think this is what’s known as heathered effect. It’s a really soft fabric and was easy to work with. 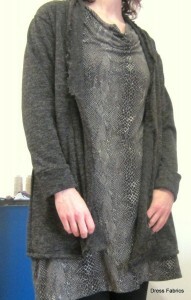 I thought I could do with a longline cardigan and I had made the Seamwork Oslo cardigan before. My first version got worn a bit last winter but it was really too big even after taking it in. This time I sized down to a medium and I think this is perfect. Its not a very neat fitting cardigan – it’s meant to be oversized. Great to throw on over a few layers for an extra bit of warmth. You could make it up in any knit fabric. It would lend itself to the Italian knitted wool in the shop or even the sweatshirting fabrics. Seamwork is an online sewing magazine issued by the people behind Collette patterns. It’s produced monthly and the patterns are available if you subscribe for around €5 a month. As far as I know the newsletter is free and is quite good. Plenty of informative articles on fabric, sewing techniques and patterns. It’s very slouchy but very comfy to wear when working away in HQ. It’s a great layering piece. It could also do with good deep pockets to stick cold hands into. Will I make it again – not sure, it’s a little oversized for me I think. 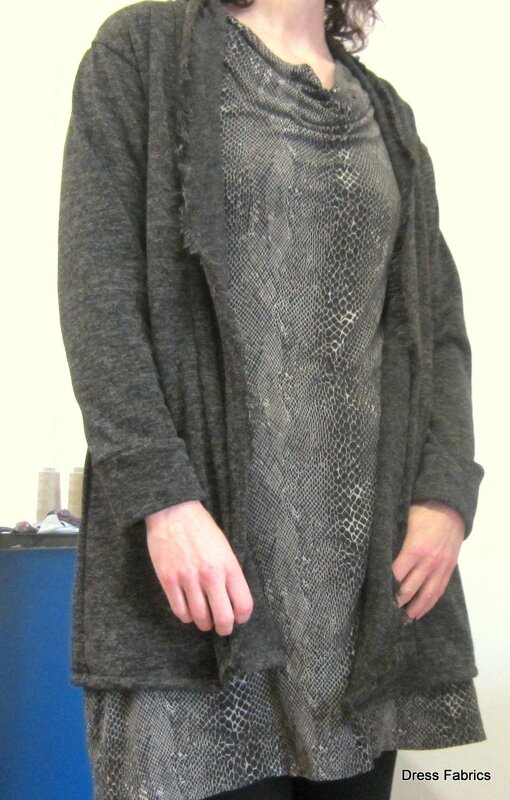 I might find another long line cardigan that’s a bit more fitted. Well – you know. Variety is the spice of life! Next to come very soon – a lovely little wrap dress I whipped up this past weekend (well – I still have to finish the hems etc)..